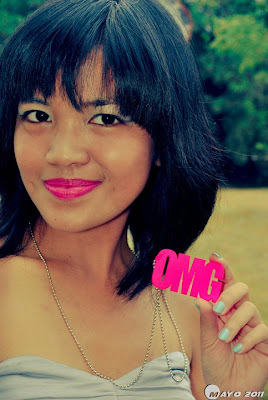 I am very fickle-minded, not only with changing my blog's layout or my clothes, but also with blog names. After changing blog URLs for about eight times, I finally came up with one that I really, really liked. In September 2008, krissyfied was born. The name stuck; I became identified with it so much that my friends even call me Krissyfied at times. In July of last year, I took it one step further by purchasing a domain the moment I got myself a credit card. These days I use my blog to tell stories of personal interest, share beautiful and chic finds, entice you with yummy food, and even post outfits. I have also been fortunate enough to be noticed by some PR firms and be invited to various events, and even test some products for review. Everything I post here have been reviewed numerous times before I hit the Publish button. I might have forgotten the sine-cosine formula, but I cannot let a mistake about the difference of your and you're slip. Other people might think it meticulous bordering on ridiculous, but I care too much about putting the right message across. After all, I believe we use our blogs best when we use them to educate, inspire and inform. More than anything else, I know my blog is serving its purpose of letting me express myself. I have always wanted to be a writer but surprise, surprise, ended up working for a bank. Whilst my job lets me afford the current lifestyle I have, I'm being honest when I say it's not nourishing my "creative and artistic" side at all. Thankfully, krissyfied.com is here to save the day and my sanity. I started this blog to have an online sanctuary for my thoughts, but now that it has become this big thing/ space/ whatever where we can all hangout, well, that's just all kinds of amazeballs! If you have been a long-time reader, I want to thank you for sticking with me through this journey. If you have stumbled on my blog just recently, I wish you can stick around and I hope we can be friends. All photos taken and post-processed by Mae Ilagan.